Everybody in the world wants to see the Crown Jewels, and if you're visiting London with kiddos you don't want to be waiting in line behind all those everybodys. I've got a few tips to share to get you in, get you to the goods, see some swords and battle armor along the way, and then be off for cocktails. Yes the Cullinan diamond is magnificent, but you're going to need a glass of bubbly to cheer yourself up when the guard doesn't let you take it home. The Tower of London lets you buy your tickets in advance and gives you a seven day window in which to use them. Which is awesome (and rare) because when you're traveling as a family you need a bit of flexibility in your schedule. Print out your tickets from home or use the hotel printer (there's always a station for printing out boarding passes) before heading out the door and you will be so much happier when you see the masses outside the Tower Hill tube station. Like a jewel thief planning a heist you've got to grab a map (free at the info and ticket booths), plot your course, and stay focused. 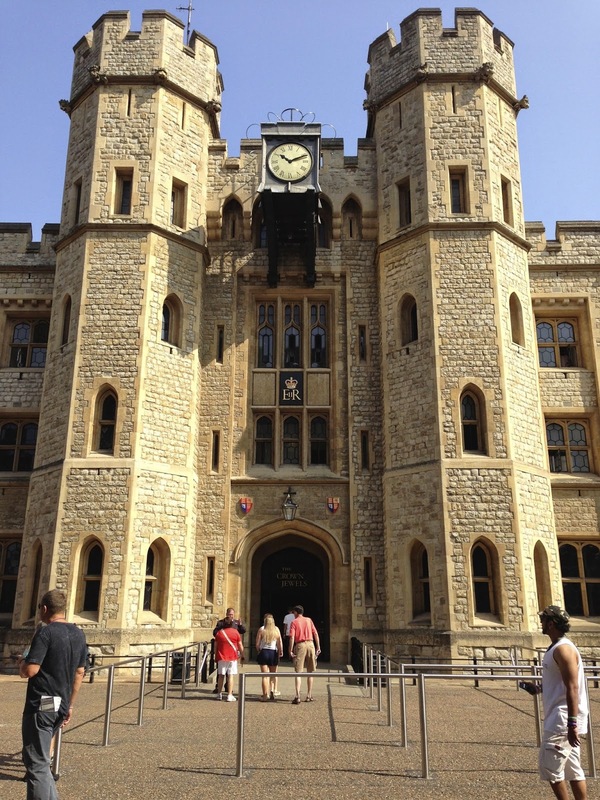 Try to get to the Tower as soon as they open, 9:00am Tues - Sat, 10:00am Sun & Mon. Head straight through the entrance gates, make a left at the Bloody Tower and straight back to the Waterloo Block and home to the jewels. Don't let the kiddos (or you) get distracted, the Beefeaters have been there for more than 600 years and they'll still be there after you tour the Crown Jewels. You can see in the first photo (at 10:10am) we didn't have to elbow our way through the displays with hundreds of tourists from around the world. And let me assure you it was not the case as we exited the building 20 minutes later. Crowds were already winding their way through the barriers as the hot sun beat down (there's no shelter, no matter what the weather) and the boys were thankful I made them rush. A moving conveyer belt whisks you past the greatest treasures of the British Empire. I lost count of how many times I rode it, while the little C&Gs (and Mr. C&G) waited patiently by the exit. 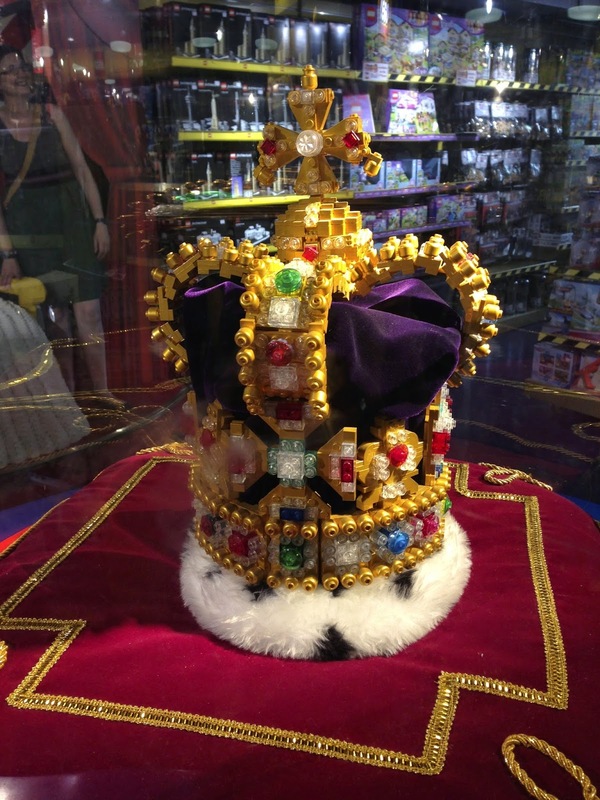 The diamonds, rubies, sapphires, pearls, crowns, scepters, orbs, rings, swords and diadems were dazzling. There's no nose pressing or photos allowed so the best I could do is share with you the Lego version of St. Edwards crown. I think the boys found this one much more fascinating than the real thing. We grabbed a quick snack and some drinks from the cafe (raspberry tarts with powdered sugar crowns should be the official C&G dessert) and then made our way to the White Tower. If you see a Yeoman Warder (the dark blue and red coated Beefeaters) giving a tour, they're free and you can come and go with the group as you please. The White Tower is much more entertaining than the sparkly bling of the Crown Jewels (for the kiddos, not me) with the endless displays of arms, armors, and life-sized carved wooden horses. 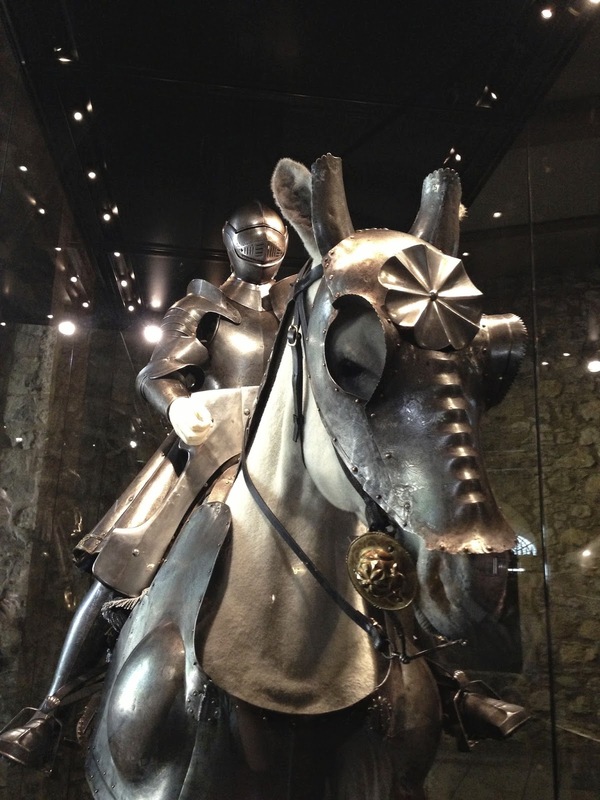 Check out the many different versions of armor made for Henry the VIII to accommodate his changing size. On the top floor you'll find a giant dragon made from old weapons and lots of hands on activities for the kids. Move the kids out of the way and channel your inner Braveheart (or Brave) with the arrow shooting challenge. Those tiny eye slits make it virtually impossible to hit your mark. By the time you've worked your way around the rest of the Tower of London it will be time for a drink. And maybe some food. Escape the crowds (after taking the requisite photo in front of Tower Bridge, aka London Bridge) by heading for the St. Katherine Docks where you'll find the very popular chains Strada, Zizzi, and Côte Brasserie. Chains in the UK are nothing like what we have at home, they're all very good, fresh, delicious and fast. With a full wine list. And cocktails. Yet another reason I want to move to the UK. . .
Munich Madness, Go FC Bayern München!